“Thousands have lived without love, but none without water”. Water, as we all know, is the most essential for survival and supporting economic, social and human development. World Water Day, on 22nd March every year, is about reminding ourselves on the importance of water. We would be hard-pressed to go without water for few hours, let alone one whole day. Today, more than 663 million people are living without safe water supply. Every change can make an effective impact in terms of water conservation – and that’s especially true when it comes to laundry. Changing a few simple steps in the way we do laundry can save significant water and energy. This is what LaundroKart has been doing always and will continue to do so. At LaundroKart, our vision is to carry out laundry services without causing harm to the environment. We are proud of the fact that we have been contributing to a better environment in many ways. All the detergents that we use are bio degradable. They are free from the harmful, toxic chemicals that contribute to water pollution. Bio degradable detergents reduce greenhouse emissions and can be decomposed by the biological agents within a month, so it is less likely to harm the environment. As they are concentrated detergents, it requires less water for the laundry, thereby saving water. Plastic bags clog water bodies and pose a serious threat to life within our lakes. Whereas bio degradable bags can be decomposed easily into elements that are not harmful to the soil or water. We at Laundrokart use eco-friendly bio degradable bags. Another way we optimize water is by using different wash formulas for various kinds of fabrics. Depending upon the load of the laundry, we use different size cycles and take advantage of the washer’s “small load” setting, which can save gallons of water every day. Globally, over 80% of the waste water generated flows back to the environment without being treated. But, at LaundroKart, we have a water softener plant in our centralized processing unit, to make sure that the water clarity, hardness, total dissolved solids, iron, pH and bicarbonates are maintained at the right level. The hardness of the water is less than 40 ppm when it is used for the laundry services. Before disposing the used water, we check not just for bacteria, but also for other contaminants that can potentially cause serious water pollution. We filter, clarify and sanitize the effluent water from the laundry plants. 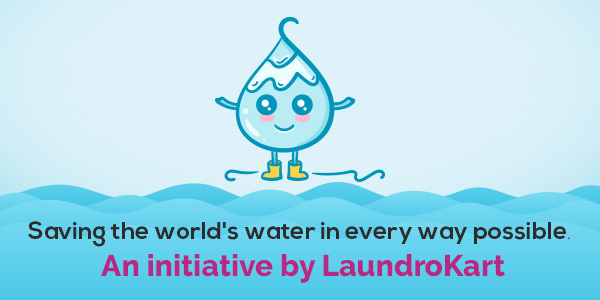 Here, at LaundroKart, we aim to help our world make better use of its most valuable resources – water. There are a number of ways to save water and they all start with YOU. We have done our bit, and we hope you will be able to do yours. This World Water Day, make a pledge to yourself to save water in every way possible. Conserve water, Conserve life! Next 5 STAR ROLL POLISHING SERVICE, NOW IN BANGALORE!